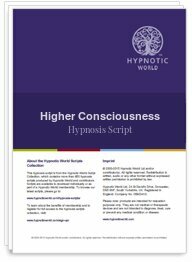 Tune in to your higher consciousness with this mystical, hypnosis script. Visit a place where the sounds of the Universe are all Creation are incorporated into One - and you - as an observer - have absolute knowledge - your mind can travel outside the physical realms of the here and now - you can venture into the future - or way back into the past - discovering the secrets that have been inaccessible to the conscious thinking mind. The Higher Consciousness script can give you or your client crystal clarity.